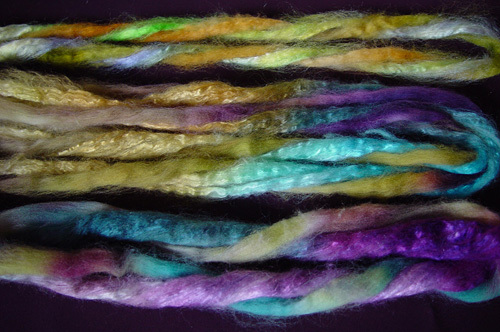 How many two- to four-ounce hanks of handpainted fiber do you have in your stash? Since I’m a color glutton of the first order, I’ll be first to admit I have plenty. Since I’ve hoarded so much fiber (OK, I dyed a lot of it too) many of these beauties have some kind of affinity for one another. Here’s how I stockpiled enough coordinating yarns for a cool moebius wrap from fiber I already had in my stash. I generally start sorting fiber for a project with general vision of my finished project in mind, but am always open to making changes along the way. Often these changes grow organically out of the yarn design process. Originally I envisioned a small shrug but as I kept knitting my color samples into a longer and longer gauge swatch, I decided to transform the swatch into a wrap instead. I had a limited amount of fiber so I figured both a wrap or a shrug would take a similar amount of yardage, but with the wrap I wouldn’t freak about running out of yarn or having to rip out my growing and beautiful swatch to reknit something else. Even before I designed Justify, I figured whatever I designed would take in the neighborhood of 600 yds of chunky yarn to knit on US 10 needles at a gauge of 14 sts and 24 rows per 4 inches. My usual lofty 100% wool chunky handspun averages about 80 yds per oz. 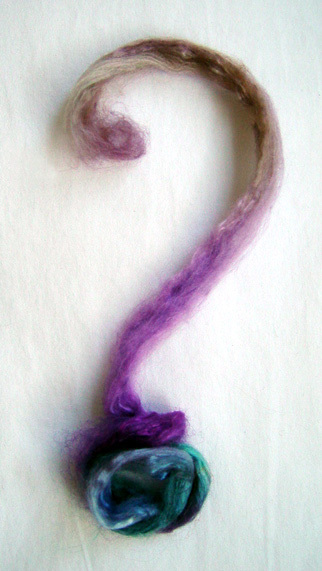 (divide number of yards in sample skein by its number of ounces for yds per oz). That means I’d need at least 8 oz of fiber to get my yardage. But it never hurts to have a little extra. This bobbin holds 170 yds of finished yarn. 100% tussah silk one of a kind I”ll call “Sunshine”. Surrounding all, LV ltd 100% merino wool in “Velarde”. Sure, I could take two four-ounce wool handpainted rovings and ply them to each other, but that’s too easy for me. Why? Because it’s so hard to make up my mind. Riffling through my stash, I keep discovering more and more handpainted wool and wool/silk blended rovings in spring and autumn hue combinations of green, gold, violet and teal. 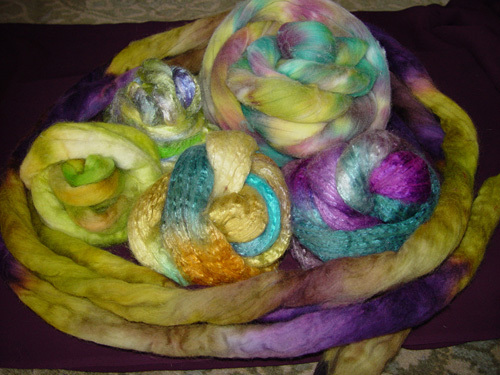 Each roving has at least three out of four of the above colors in similar values; they are all basically medium pastel. I avoided choosing colors that were significantly lighter or darker, as they tend to rob the pastel colors of their brilliance. 2.Determine the width of your row in inches. 3.Multiply that width by 4 (we’ll call this A). 4.Determine how many rows in your desired length (length in inches times row per inch: we’ll call this B). 5.Multiply A and B. Divide by 36 (number of inches in a yard) and there’s your approximate yardage. If you have a lot of shaped pieces, just figure the yardage for each piece as simply as possible. You can always use the extra yardage for something. Know that the larger your needles, the less overall yardage you’ll need regardless of yarn grist. Altogether I found at least 6oz of silk or silk/wool blends and about 10 overall ounces of 100% wool. Definitely enough to start playing. Now that I have a pile of fiber in front of me, but I don’t want to waste too much time or fiber in sampling them all, I’ll take a thin strip of each and wind them together into a fluffy faux yarn just to see what the colors will look like combined. The finished yarn will be darker than the unspun fiber, but I’m just looking for color balance at this point. I know also that if I like what I see, I’ll probably like the yarn too. So far so good. I divide the silk blends (mostly 50%/Merino/50% Bombyx or 100% Tussah silk) into one pile and the 100% wool rovings (Merino or Blue Faced Leicester) in another. By spinning a length of each color from its respective pile into the same single I can extend a number of small amounts of fiber into an entire bobbin of coordinated singles yarn. I”ll do the same with the silk blends, then ply the two singles together into a drop-dead gorgeous 2-ply yarn. Before spinning, I make long narrow strips of each of the rovings and arrange them in piles. Working with the wool first, I alternate spinning long strips of “Woodland” and “Velarde” with short strips of “Luna Moth”. 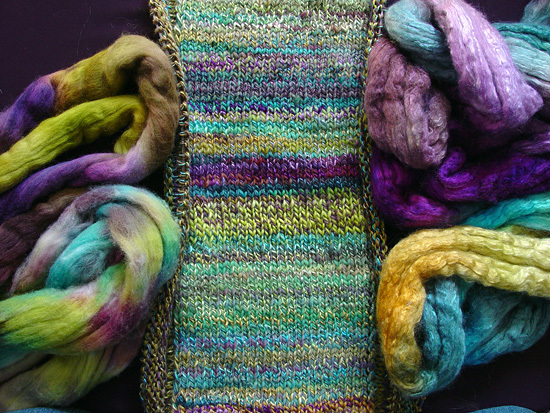 I like to join one colorway to the next on a like color, such as violet to violet or green to green. All my wools have similar shades of yellow green so joining the different colorways on these green bands gives my overall yarn smoother transitions. Say I want to match green to green but my next strip of roving has violet on the end, I just move down the strip to a green band and break the roving, and make my join with that piece. Later on I can join the violet end on when I come to violet and so on. from top: “Luna Moth” and “Sunshine”, “Velarde” and “Tuscany”, “Woodlands” and “Undercurrent”. Not only do these pairs of colors look good together, they look like they will look combined interchangeably with colors from the other pairs. I spun the wool ply first, making it about 18 wpi using a short draw technique. I spun what for me is “fast and sloppy” (my version of trying to be a beginner again) because I wanted a quasi thick and thin yarn with a fair amount of loft and plenty of character. In other words, I didn’t work too hard to make a smooth and even yarn. 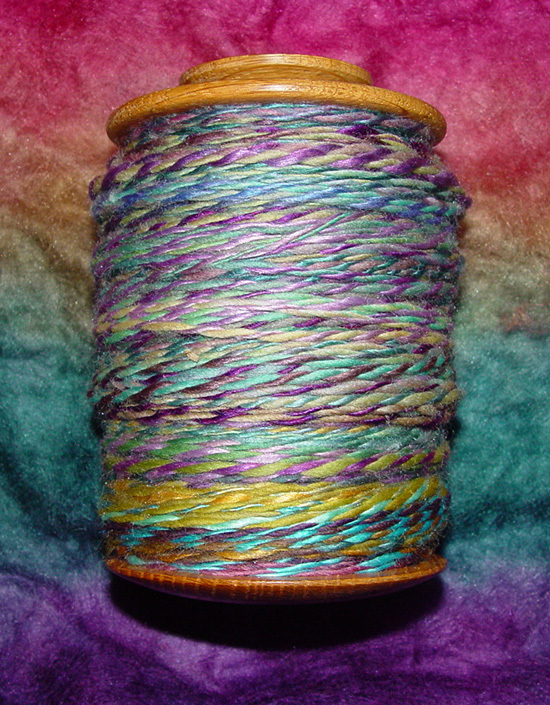 I spun the silk blend ply thinner (24 wpi) and smoother than the wool ply mostly because it was the natural thing to do. There was less silk in my stash and I wanted to make it go farther. Because silk is shiny, it is more noticeable so I don’t need as heavy a ply for it to show to full advantage. Plus, a thin shiny ply plays up the loft of the thicker wool ply. Finally, silk tends to spin up thinner because it doesn’t have the lofty quality of wool, so I didn’t have to work too hard to make the silk ply thinner. 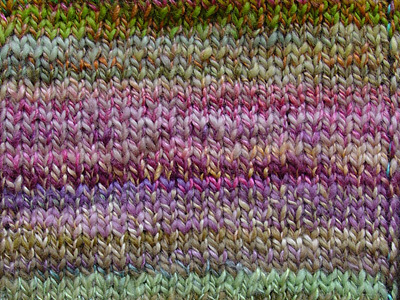 Here’s a sample swatch knit from my finished yarn. fibers clockwise from lower left: “Woodlands”, “Velarde”, “Undercurrent”, “Tuscany”. 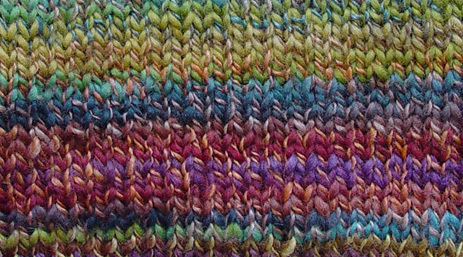 Three combinations of colorways in yarns from the top down: “Woodlands” and “Undercurrent”, “Velarde” and “Undercurrent”, “Woodlands” and “Tuscany”. Yarn knit along sides of stockinette panel combine “Velarde” and “Tuscany”. As I spun different color samples, I knit them into a sample swatch which grew and grew into the stockinette panel of my Justify wrap. so I included them in the sample swatch to add a touch of excitement. Three Waters Farm 100% BFL wool in “Lotus” plied with Capistrano Fiber Arts 50% merino/50% bombyx silk in a one-of-a-kind experiment. LV ltd 100% merino in Santa Fe plied with LV ltd 50% merino/50% bombyx in “Red Merle Aussie”. If you don't find Lynne dyeing, spinning, knitting, or crocheting, or writing about said activities, you might try looking for her on the many woodland trails around Sewanee, TN, with husband, James, and dogs Monk and Pearl. If she isn't there, she could easily be traveling to teach workshops nationwide. Her handpainted fibers are only available here. The recent release, Twisted Sisters Knit Sweaters, is her second book.